Way back in fall of 1996, months before my first book had been published, Kathy and I had planned a mini-vacation to the East coast. We were sitting in the Minneapolis International airport, waiting to board a flight to Boston, when a man approached me. He looked at the T-shirt I was wearing and said, "That logo on your shirt: It's from the Monroe Institute, isn't it?" "Yes it is," I remarked. I was surprised; the Monroe Institute didn't have that much name recognition in 1996, and the shirt didn't have any writing; just the TMI logo. I asked, "Are you familiar with them?" He said, "Yes. They do out-of-body experiences, right?" So like age-old friends who had just met, we started talking about OBEs, life and spirituality. I introduced myself and told him I had written a book about my OBEs and I was waiting for it to be published. It had been more than a year and I was getting very impatient. He introduced himself as Kurt Leland, and he said he had had many OBEs himself. I asked him to tell me about some of his OBEs, which he proceeded to do. They were fascinating and I was enthralled. I said, "Those are really awesome OBEs, man. You should write a book about them." He asked, "Really? You think so? They're not too boring?" He seemed really hesitant about the idea of writing a book about his OBEs, even though he was already an author and had written a book called Menus for Impulsive Living. I said, "Absolutely. When I get back home, I'll send you the contact info for my publisher, Hampton Roads Publishing. They're slow as molasses, but they're really good." Leland thanked me, then invited us to visit his apartment in Jamaica Plain, a suburb of Boston. He told me he channeled an entity named "Charles" for a small group of friends, and asked if we wanted to come. That night, we followed Kurt's instructions and took the train system out to his apartment. It was a long ride. I seem to recall we had to ride the train to the last stop, then walk two or three blocks further to his cozy apartment on Spaulding Street. The evening with Charles was wonderful; Kathy had never seen a live channeler in person before. At the end of the evening, I told Kurt again that he needed to write a book about his OBEs, and that I'd send him my publisher's contact info. The following February, 1997, I sent him all the info, along with another encouraging letter. A year or so later, Kurt mailed me an early proof of his book, Otherwhere with a letter of thanks. It was published by Hampton Roads. I feltvery proud and had a wide smile on my face. It was finally published in 2001. Many years later, a woman came up to me at some event and asked, "Have you ever heard of an OBE author named Kurt Leland? 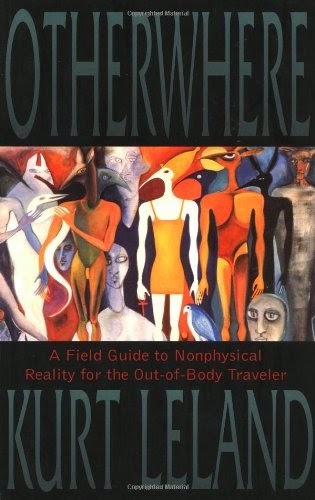 His book Otherwhere is just awesome. It's my favorite OBE book. You really need to read it." I laughed and told her the story. "I'm the one who told Kurt to write it! If it wasn't for me and my encouragement, that book might not have been written. I still have an original proof of the book." Two other times, I've had people come up and tell me the same thing; this happened again just a few weeks ago, in January, 2015. It's been many years since I read Otherwhere, but I still have fond memories of it. I may need to re-read it again to give it a proper book review.